DEC has received a Brownfield Cleanup Program (BCP) application and Draft Remedial Investigation Work Plan for a site known as 820 Linden Ave Site, site ID #C828200. This site is located in the Town of Pittsford, within the County of Monroe, and is located at 820 Linden Ave. Comments about the application and draft investigation work plan must be submitted no later than February 9, 2018. A copy of the application, Draft Remedial Investigation Work Plan and other relevant documents are available at: Pittsford Community Library, 24 State Street, Pittsford, 14534. DEC invites the public to comment about proposed expedited cleanup activities to address contamination related to the Ever Nu Metal Site (20th St., Brooklyn), within New York's Brownfield Cleanup Program. Public comments about the proposal will be accepted through February 9, 2018. Click the web link above at "Additional Information" to learn more about the proposal and how to comment. Project documents can be reviewed at: Brooklyn Public Library, Park Slope Library, Attn: Stephanie Brueckel, 431 6th Ave., Brooklyn, NY 11215; phone: 718-832-1853 --and-- Brooklyn Community Board 7, 4201 4th Ave., Brooklyn, NY 11232; phone: 718-854-0003. DEC invites the public to comment about proposed cleanup activities to address contamination related to the South Island Apartments Site (Osgood Ave., Green Island), within New York's Brownfield Cleanup Program. Public comments about the proposal will be accepted through February 9, 2017. 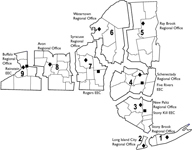 Project documents can be reviewed at: Village of Green Island Offices, 20 Clinton Street, Green Island, NY 12183; phone: 518-273-2201. Five Rivers - Family Fun: Fur, Fluff and Fun! Family Fun: FUR, FLUFF AND FUN! How do animals keep warm in the cold winter? Where is the bear? How about the hare? And the Blue Jay, does she go away? Beaver, coyote, rabbit or deer, what is the warmest pelt you’ve ever felt? Come check out some of the furs we have at Five Rivers and see who’s at the bird feeders too! Did you find, see or hear something cool outside and want to know more about it? Ask a Naturalist! A Five Rivers educator will be on hand in the Visitor Center’s Exhibit Hall to answer, or help find answers to questions you may have. Discover the woods in winter! Try snowshoes or cross-country skis for free, go on a winter scavenger hunt, and make snow art. Enjoy ice-fishing demonstrations, winter crafts for kids, and more! Refreshments for sale. For more information, visit www.reinsteinwoods.org or call 716-683-5959. No registration required.